Sheilacakes: Somehow I know we'll meet again. Not sure quite where and I don't know just when you're in my heart so until then it's time for saying good bye. Somehow I know we'll meet again. Not sure quite where and I don't know just when you're in my heart so until then it's time for saying good bye. On August 12, 2005 my best friend went to Heaven. She was no doubt greeted by her husband Jim, Her sons Jimmy and Steve and many other family and friends that love her. My best friend that I lost was my Grandma Rose. I had a unique relationship with her. She was more than just an old lady who was my mom’s mother. She was my best friend. Ever since I can remember we were attached at the hip. My favorite thing to do when I was young was spend time with my grandma. She was an amazing woman who touched the lives of thousands no make that hundreds of thousands. She opened a soup kitchen and with that single act has fed 100,000’s of hungry mouths. She would hold garage sales for charity and she was a member of many clubs and organizations that helped so many people. She would take in her kids’ friends. She had amazing faith and was a strong Catholic woman. She always put God first in everything she did. My grandma would help anyone she could. She was truly an inspiration. Growing up Grandma and I would play many games and sing songs. Some of my favorites are Sookie and witch in the well. I someday want to publish the story of Sookie and dedicate it to her. I remember how we would play London Bridges too. I caught myself the other day playing it with my son. I cherished every moment and memory with her. We would walk to the store and get treats. We would have to walk thru the deep valley to get there. It was always fun and we would hold hands the whole way there and back. We would sometimes have lunch at Mc Donald’s. Ok we almost always had lunch. We would go to the mall and walk around the whole mall a few times for exercise. We used to play a lot of cards as well. We played Euchre, Bone yard, Old maid, and 21. We also played Rummy. My favorite thing to do with her was the I love you more game. Whenever one of us would say I love you the other would say I love you more. We would go back and forth until one of us would say we love each other equal. I knew if I just showed up at her house she would have a cold drink in the fridge and a goody bag made up for me. The grand kids would spend New Years at Grandpa and Grandma’s house. It was family law. It was a big party. We would have a piñata made out of a brown paper sack filled with treats. We always made two banners. One saying good bye to the year that was ending and one welcoming the New Year. Grandma had a clock that you could move the hands on it and we would change it to midnight some years and then go outside and bang pots and pans. I have so many wonderful memories of my Grandma Rose. We had so much fun. She would make me lists of chores and I would pretend to be Amelia Bedelia and mess them up. It was one of my favorite games we would play. I loved to cook with her and help her do the dishes. I would stand on a chair right next to her. I usually would dry them because I didn’t want dish pan hands. She taught me how to iron and sew. I still sew like I did when I was oh say 9 years old. That is ok though. Grandma would tell me all kinds of stories about when she was little or when my mom and aunt and uncles were little. I remember I would listen to her wide eyed and attentive. We used to read Good Old Days Magazine before bed. She and I would play a game to see who could go to sleep the fastest and the winner got a candy bar. She always let me win. My Grandma Rose was a fighter. She might of weighed 112 pounds and stood at 5’2 but she wasn’t going anywhere without a fight. She had her first open heart surgery in 1979 when I was still in God’s pocket. People are supposed to get another one every 10 years. She went 16 before having another. There were a few times where the doctors would say to us this is really risky you should say good bye to her because there is a good chance she won’t make it. Every time she pulled through. She had a whole lot of living to do. She ended up developing Alzheimer’s disease. It was heart breaking to see her go through it. She didn’t know who anyone was or where she was and in some cases who she was. I can’t imagine how scared she must have been everyday. She seemed to remember me the most often probably because I am the baby of the family. The last time I saw her was when she was in the hospital. She was pretty out of it. When I had to leave knowing this was the last time I would see her on Earth probably. I said I love you Grandma. She responded I love you more. It was like for an instant she was her normal self. I really feel like God granted me that moment and I will never forget that. Of course I cried the whole way home. She went peacefully with my mom and aunt by her side. I think about her all the time. Sometimes I come across her things and I smell her on them. It is like she is there with me. I know she is. I strive to be like her every day of my life. She was and always will be my role model and best friend. I miss her so much. I wish she was here to play with Noah. I know she is smiling down on us and living through all that love her. Rest In Peace Grandma Rose 1917-2005. I know I will see you again. I love you and miss you always. 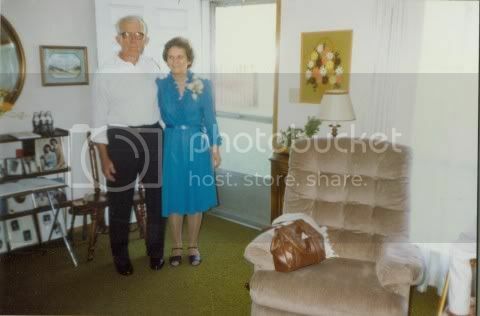 Here is a picture of My Grandma Rose and My Grandpa Jim. It was from their 50th wedding anniversary in 1988. They were the happiest couple in the world. They were soulmates.